Let us discuss the comparison of Sublime Text editor and Atom Text editor. Changing the IDE or text editor is really a huge deal for every developer and if there is not significantly new features most people will just ignore it. So we have mentioned clearly the features, pros and cons of each text editor which will let you choose the best. 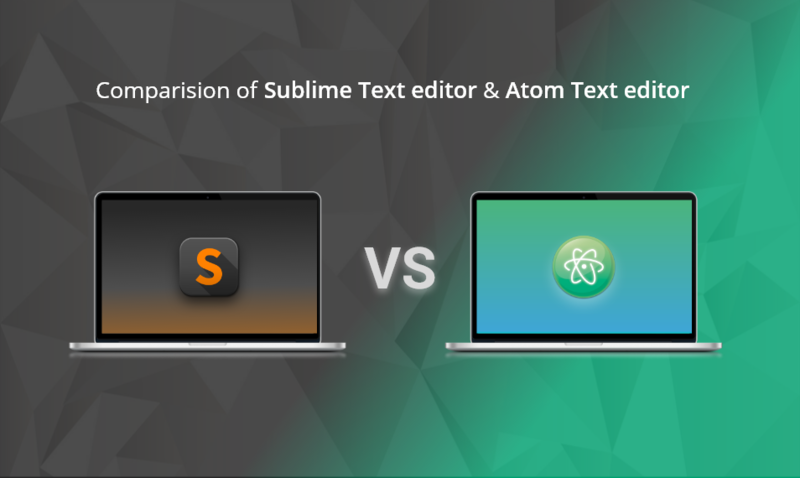 Before going directly into the differences we have explained what is Sublime text editor and atom text editor. Sublime text editor is proprietary software which is a cross-platform text and source code editor, with a Python application programming interface. It is without any doubt the most welcome light weight editor for developers, it does not even require a lot of installation space and working with it is just plain fun. Pricing Info Sublime text offers a free downloadable version of the software but is limited. You need to purchase a license to continue the usage. Atom is free and open-source text editing service which can be installed on OS X, Windows, and Linux devices. User Friendly When you start using Sublime text as a beginner, it doesn’t drown you in keyboard shortcuts. However, high-level functionality can still be accessed easily when the need for it arises. One of the goals of Atom is to be a text editor that is available for both experienced and beginner programmers. You can add keyboard shortcuts, install plugins, change themes, and change core settings by clicking through a GUI, or by manually editing config files the old-fashioned way. User Experience Sublime text doesn’t come with a real good-looking minimal and flat designed user experience. But the best part of sublime text is that there are hundreds of theme that you can install to make your sublime text user experience just the way you want it. Atom editor provides a lot of things that comes out of the box without any manual setup or installation. You can find a number of themes that can be used for multiple purposes. SetUp Sublime doesn’t come with in-built package installer and you need to manually install the package installer to install third-party packages. Atom comes with its in-built package installer and you don’t need to waste your time in doing this boring task. Shortcuts and functionality Sublime provides a ton of shortcuts and functionality to make your work done faster. Atom provides a number of features and to get these same set of features in Sublime you need to install the third-party packages. Third-Party Package Availability As Sublime editor is an older text editor than atom it comes with unique and variety of packages. Atom text has thousands and thousands of package available to install which are not similar to Sublime text. In the end, both Sublime and Atom text are awesome text editor with a ton of features and third-party packages to make your development life a little easier. But if you are already using any of the text editor on daily basis and already spend a lot of time in choosing and installing your favorite packages, then it really doesn’t make any sense to move to other text editor. But if you are just thinking of using a new text editor and didn’t use sublime text or atom, then both of them is really a good choice. You just need to spend some time in learning it’s shortcuts and features along with finding the packages you want for your development environment.